Your Skin - Home to Millions of Micro-organisms. To a micro-organism, the human skin seems very much like the planet Earth seems to us. Just like our planet, our bodies contain numerous different environments, ranging from dry deserts (e.g. the forearm) to tropical forests (e.g. the groin). Each environment possesses certain advantages and disadvantages and different micro-organisms have adapted to certain regions of the body for their particular needs. Who's Living on Your Skin? The surface of the skin itself comprises several distinct environments. Areas such as the axilla (armpit), the perineum (groin) and the toe webs provide typically moister regions for bacterial growth. These "tropical forest" environments often harbour the largest diversity amongst the skin flora. Typical organisms include Staphylococcus aureus, Corynebacterium and some Gram-negative bacteria. The bulk of the human skin surface, however, is much drier and is predominantly inhabited by Staphylococcus epidermidis and Propionobacterium (SIUC). How many micro-organisms inhabit our skin? In his seminal work Life on Man, bacteriologist Theodor Rosebury gives a full biological and historical account of the microbes that live on the average human. The numbers involved are huge Rosebury tells us: "If we are to get to the microscopic centre of this with our eyes open and our stomachs steady, we might do better to look gingerly and sip instead of gulping . . . the life on man consists of microbes in extraordinary variety and large numbers." those that are transient. Of course, any number of fascinating and nasty parasites can join this microbial community and make the human body their home. Microbes inhabit every surface of a healthy adult human that is exposed to the outside, such as the skin, or that is accessible from the outside. Rosebury estimates that 50 million individual bacteria live on the average square centimeter (5x107/cm2) of human skin [5x107/cm2 x 20,000 cm2/person = 1011 bacteria], describing the skin surface of our bodies as akin to a "teeming population of people going Christmas shopping." However, this figure can vary widely throughout the almost two square meters that make up the total surface area of a human (2 m2). In the oily skin that is found on the side of the nose or in a sweaty armpit, the figure can increase tenfold, while once inside the body, on the surface of the teeth, throat or alimentary tract, these concentrations can increase a thousand fold. These inside surfaces are the most densely populated region of the human body. Conversely, on those surfaces where there is liquid flow removing bacteria, such as the tear duct or genito-urinary surfaces, the populations of organisms are much thinner. Indeed, Rosebury could detect no microbial life at all in the normal bladder and lower reaches of the lungs. Yet, while the figures appear huge, he estimates that all the bacteria living on the external surface of a human would fit into a medium-sized pea, while all those on the inside would fill a vessel with a capacity of 300 milliliters (300 ml) [the size of a small coffee mug]. These figures increase if disease organisms are present, such as a virus or other infection, but not by any statistically significant amount. While the total number of organisms living on us is huge, when one considers the total volume of the human body, the volume of species using us as home is not really that great. As to the total number of species that are inhabiting a healthy body, estimates vary as more species are discovered on a seemingly regular basis, but Mark Pallen, a Professor of Microbiology based at the Queen's University of Belfast, reckons that the figure is greater than 200 species. Of course, it's not just bacteria and viruses that make people their home. In his books Roger M. Knutson describes the wide range of parasites that live both on and inside you [6, 7]. These tend to be microscopic organisms, and some of them can be pretty gruesome creatures. Scanning electron microscope image of a modern human head louse, Pediculus humanus. Credit: Vincent S. Smith, University of Glasgow. 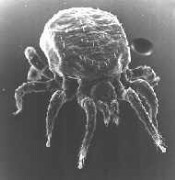 Lice are perhaps the most common of these body dwellers. They have the ability to get everywhere from your hair to your armpits to your groin. Nonetheless, they tend to be more itchy than damaging -- unlike ticks, which can cause any number of nasty and exotic diseases from Royal Farm Virus to Omsk Hemorrhagic Fever. [Editor's Note: And don't forget Lyme Disease.] 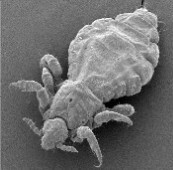 And then there is the scabies mite, which is believed to infest millions of humans worldwide, and is able to burrow into the body to hide itself, causing a nasty itch. Fortunately, its close relative, the follicle mite, which is found on everybody in the world, happily munches dried skin cells and causes far less aggravation. [Editor's Note: Don't forget, however, that many persons are allergic to the excretions of mites that can also live on pillow and mattress dust for long periods of time. By the way, have you ever taken a close look at the standard electron microscope snap-shots of these weird creatures. They look like they just stepped out of a B-class science fiction or horror movie.] And not all body parasites creep and crawl - you can find fungi in your hair and mould in your skin folds if you look closely enough. In addition to his statistics, Rosebury treats us to a fascinating tour through little-known by-ways of literature and anthropology, documenting historical and cultural attitudes to obscenity - regaling us with tales from Rabelais and other great scatologists. 1. Theodor Rosebury, Life on Man (Secker and Warburg, London, 1969). 2. Question by Roger Taylor, "Bodily Breeding: How Many Different Species Live on or in the Average Human Body and What is the Total Population of These Guests?," New Scientist (September 30, 1999)[ www.newscientist.com]. 3. The New York Times, Science Section D (October 2, 2000). 4. The Los Angeles Times, p. B2 (October 26, 2000). 5. Paul Taylor (January 28, 2000) [ www.nous.org.uk/Rosebury.html ]. 7. Roger M. Knutson, Furtive Fauna: A Field Guide to the Creatures Who Live on You (Penguin; 1992)(Ten Speed Press; 1996). How Can You Help Your Skin Maintain A Healthy Skin-Environment? With this multitude of organisms living on our skin, some good, some not so good, how can we make sure we maintain our skin to be a healthy, balanced ecosystem? Our skin continually replaces itself, new skin cells are replacing dead ones and the process keeps going until we die. There are however ways, we can promote the health of our skin and its micro-organisms. Following a natural skin care regime, that is using natural exfoliants, cleansers, toner and moisturisers, we can reduce the risk of certain microbes becoming dominant and potentially causing problems. Exfoliation is very important to keep the number of dead cells on our skin to a healthy level and in reducing the number of some mites and other micro-organisms discussed above. Cleansing our skin, using a natural skin cleansing lotion on a daily bases, and two or three times a week applying a deep cleansing facial/body mask, helps to keep pores and skin folds clean and reduces the risk of skin irritation, acne, fungal infections as well as other skin problems. Toning is a process often left out of a skin care regime, but this is a big mistake, because toning the skin closes pores and thus reduces the risk of external environmental particles, including bacteria, from entering the pores and potentially causing problems. In addition, it helps to re-establish and maintain the Acid Mantel which provides protection of our skin. It is a must include step for anyone who is serious about maintaining healthy, vibrant skin. Finally, moisturising helps to preserve the moisture in your skin and adds nutrients and therapeutic substances, which your skin can utilise to protect, hydrate and defend itself from the various environmental assaults on it. As we age and the skin looses some of it regenerative power, we may wish to provide it with additional help. Using anti-aging creams that help in stimulating circulation, promote collagen production and is soothing and hydrating, may well be added to a skin care regime to help reduce the wrinkles and fine lines that start to form as we get older. Visit Wildcrafted's Natural Skin Care Range, for a Full Description of our Product Range.